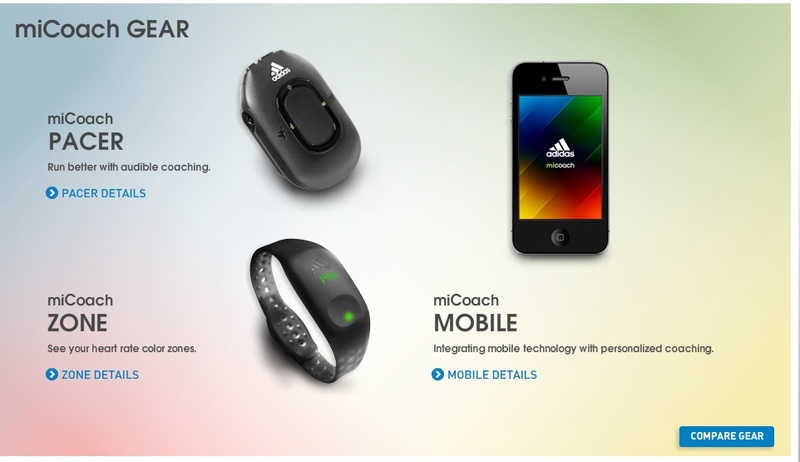 For the last month or so in preparation for the 2011 Boston Marathon I have been using adidas miCoach. training program. I am finding micoach to be a fantastically well designed and executed program, once understood-integrating smart phones, web, and optional gadgets. It is a bit complicated from a "marketing" and initial presentation and explanation standpoint. I hope this post helps explain the various elements. 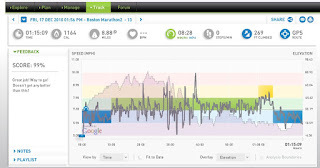 a free GPS based pacing program miCoach Mobile for certain Blackberry smartphones and carriers as well as an iPhone app. (more on this later). a free web site to upload the results of your workouts, see them on a map, tabulating elevation gained and even get a score vs. goal. 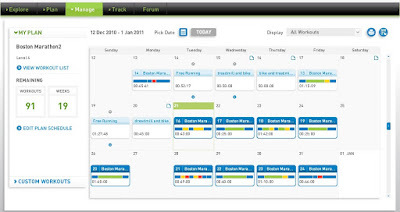 very well designed workouts and calendar schedule for different race distances, abilities, and also for sports other than running. a stride counter, audible pace, stride, distance HR player with transmitter to PC the miCoach Pacer ($139.99) all associated in a package with the heart rate monitor for situations where GPS based training doesn't make work such as indoors or on trails where heart rate would be more useful than pace. MP3 players can be plugged in to provide music and coaching. 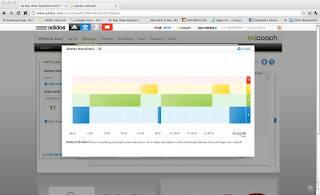 I currently use the free miCoach Mobile GPS app, miCoach web site and the Zone heart rate monitor. by pace as determined by micoach program on your smartphone using GPS- Do the assessment workout and it will automatically set the zones. I found the mellow Green where the bulk of distance work and recovery workouts are done too swift and manually reset it downward. Other faster zones seemed fine. or with the purchased stride counter and associated heart rate monitor Pacer bundle. or maximum heart rates observed and then programming your Zone HRM with your age. I found the formula in the Zone too conservative when compared to my pace based zones so I used a different max heart rate I found online adding about 10 BPM to my max heart rate. You can also do a heart rate based assessment workout observing your maximum on the watch, if you can see it as you are red lining! Tough to do as the actual numerals are hard to see in the sun. Remember that once underway the watch glows with color of heart rate zone and this is easy to see, far easier than a normal watch. 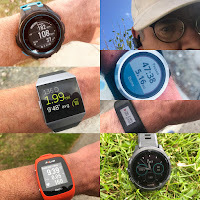 I set my Boston Marathon program up by pace but have since also gotten the heart rate monitor for those times when I am indoors or where the terrain (hills, altitude, or trails) makes the pace zones difficult to practically maintain. 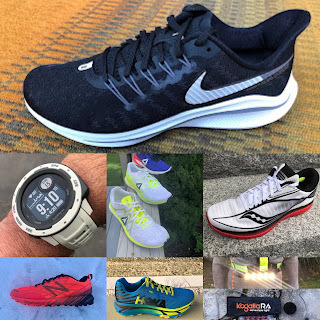 You can also manually reset your GPS pace zones on the web site and this will reflect on the smartphone app without manually connecting to your computer. Think of Blue as an easy jog, Green as moderate pace, Yellow as 10K race pace, and Red as all out. Once I select the workout on my Blackberry the phone will give me an audible command (speaker or headset) based on my pace to speed up, maintain, or slow down to stay in the zone. It will also tell me when a portion of the workout is complete and to move to the next zone. The info including actual pace can be seen on the phone screen but I typically just leave the phone in my pocket. To much information! You can also integrate playlists into the mix but as I do not listen to music when I run I can't comment on that. One weakness is that the system will not give you an audible last lap pace ( mile for example) or average pace. This is particularly useful in a "free workout", a workout not in my Boston program or during long periods at steady pace. The only pace given is a "momentary pace" at each mile which is often highly inaccurate as it is from a small sample of data. Once a workout is completed the info is summarized on the phone and also automatically uploaded to the web site. The mile paces showing then appear quite accurate. Clicking on the color bars will tell me my pace and distance in each zone and if I had the Pacer, which synchs to the computer my heart rate. The dark jaggies show that the GPS does jump around a bit in calculating pace but overall is pretty accurate Here I have done the elevation overlay in dark pink. Looks like mountains but the scale is for Seacoast Rye! Light blue are completed workouts. Dark blue are upcoming workouts. As I sometimes run on the treadmill using the heart rate monitor I list those workouts manually. With the Pacer and stride counter I could upload these. You can see the zone colors of the completed and upcoming workouts. I have a schedule all the way through Boston. 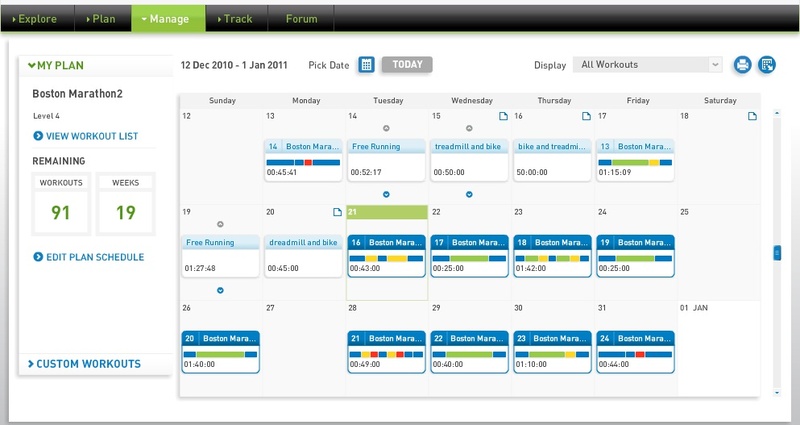 You can pick schedules for distance, ability, and time to your target race. The heart rate monitor, The Zone bought as as a standalone unit does not connect to the web site. When combined with the Pacer it does. The HRM glows and blinks with the detected zone color (Blue, Green, Yellow, and Red) . You can also push the single button to see the actual heart rate number as well as calories and elapsed time but the display is often hard to read through the translucent watch band. You can take the "pod' out of the band to dry it. I may cut a hole through the front to better see the numbers. The chest strap is very comfortable with the monitor snapping off to dry or replace the chest band. It is important to place the chest band high on the chest and wet the sensors. I found that the system takes a while, 5 to 10 minutes, to find the sensor. I suspect the batteries which came with the Zone may be low and will change them to see if that makes a difference. 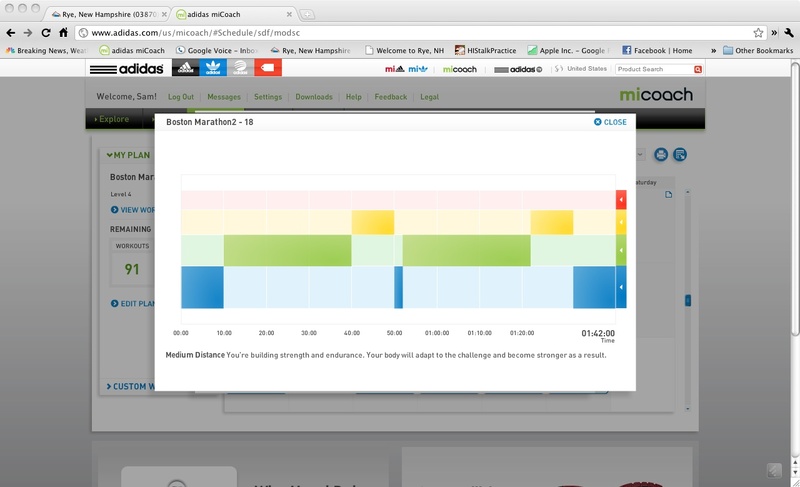 All in all miCoach is a superb integration of smartphone, beautifully designed web site, and intuitive gadgets. It will help me keep motivated and on track through the long winter on the road to Boston. It is unfortunate that the sparse explanations on the web site, lack of information on which carriers accomodate the Blackberry mobile app or for that matter information on the packaging of the gadgets on what they are or how it all works together keeps more from trying this very good and intuitve system.